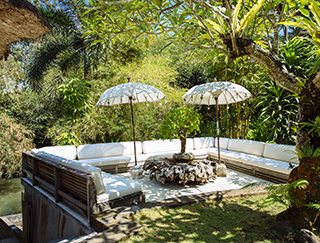 Villa Maya Retreat stretches out languidly along the banks of the Penet River that flows through the pretty village of Cepaka in the heart of Bali’s fertile ‘rice bowl’ Tabanan Regency. 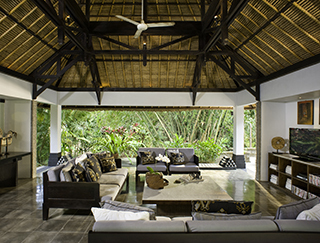 Shaded by natural jungle vegetation and lush tropical gardens, the villa’s eight living and sleeping pavilions offer total peace and privacy while maximising the serene river views. 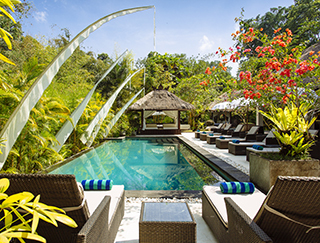 With six bedrooms, a 12 x 5-metre swimming pool, three plunge pools, two relaxation balés and secret garden hangouts, there’s plenty of space here to slow down, relax and recharge the batteries while the villa’s team of professional and friendly staff take good care of you. 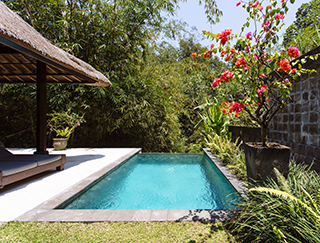 Steep stone steps bordered by lush foliage and a man-made waterfall lead down to the villa’s main entrance: a large rust-red cantilevered door that opens onto a fish-filled lotus pond traversed by stepping stones. 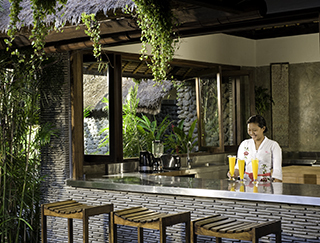 Beyond the pond, and overlooking the pool and river, is the dining pavilion which also houses an informal living area and, to one side, the kitchen. 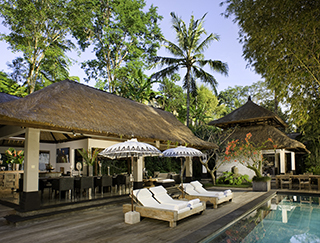 Downstream is the open-sided TV lounge and three stand-alone bedroom suites, while upstream lies the riverside lounge terrace, relaxation balé and master suite. Two more bedrooms are located on a terrace higher in the gorge, accessed by stairs to the rear of the kitchen and master suite. 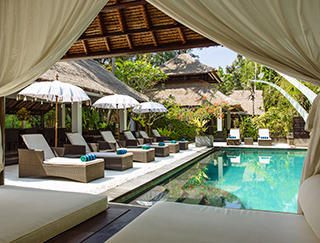 All six luxurious bedrooms at Villa Maya Retreat are housed in separate pavilions with high-vaulted ceilings, polished terrazzo floors, ensuite bathrooms and individual patios to admire the views. Every bedroom is air-conditioned and features a four-poster king-size bed with mosquito net, additional ceiling fans and a small bar-fridge. 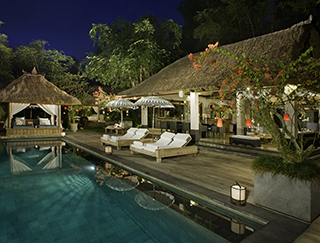 The master or honeymoon suite offers total seclusion with its own private garden featuring a 5-metre riverside plunge pool and sun deck. 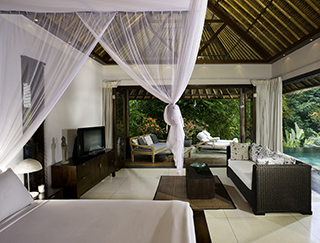 The bedroom, which has a large walk-in dressing room and a prettily cusioned rattan sofa facing a flat-screen TV, features large glass doors opening onto a sheltered patio with a comfortable daybed – just the spot for reading or bird watching. 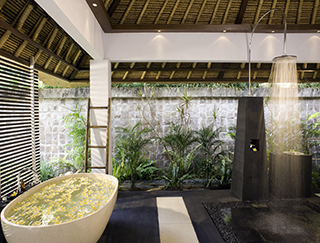 A slatted screen divides the bathroom from the garden, so guests can soak up the ambiance from the cream terrazzo bathtub or the black lava-stone rain shower. 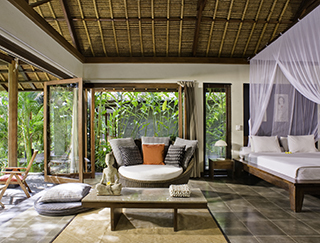 Three guest pavilions sit side-by-side along the riverbank, offering sublime jungle views from the bed or seating area through glass bi-fold doors that open onto an outdoor terrace. 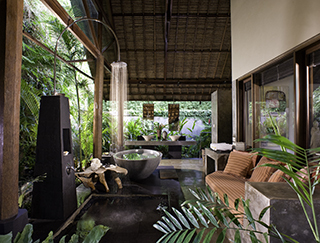 The ensuite garden bathrooms with twin vanities and a black lava-stone rain shower back onto the vine-clad stone cliff-face wall, creating a jungle-cave setting. The suite closest to the living pavilion also has a terrazzo bath in its ensuite and is equipped with a TV and DVD player. 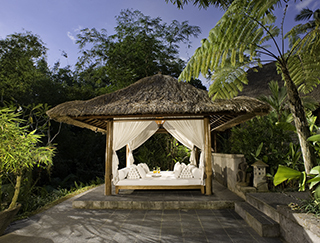 Higher up the gorge with great views of the river valley are the two upper terrace suites, each with private plunge pool and sun terrace. 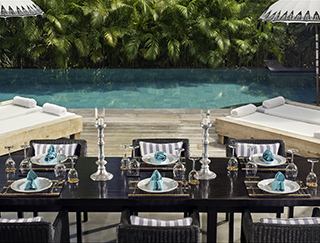 A later addition to the estate, these light and airy suites are more modern in design and include black rattan sofa and table sets – perfect for afternoon tea. 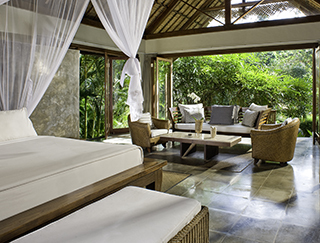 Both ensuite bathrooms – one semi-open, one enclosed – have tubs and rain showers.